Keep your favourite photos with you at all times with a personalised wallet for men made with your own photo. 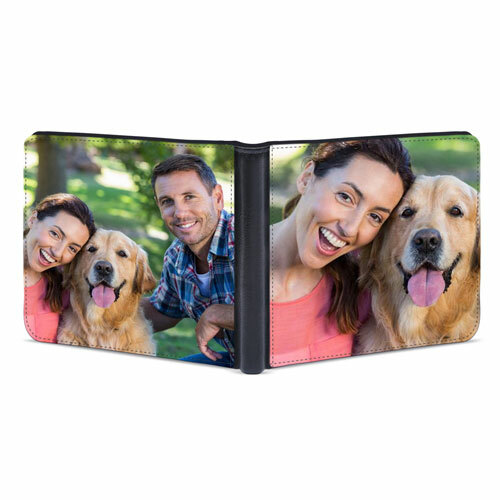 This stylish and handsome wallet is printed with your photos on both sides. You can fit bank notes in the full length pocket. There are credit card slots on the inside of the custom leather wallet too. Upload your photo and customize your own wallet online so you can create your own personalised wallet. Why not use a unique image and create your designer wallet to show friends and family? It is simple to customize your own wallet using Red Snapper’s online using our designer. Now you can create your design using you mobile phone. Our online wallet designer is fully mobile responsive – so you can create your custom wallet gift while you are on the move! Why not create your own men’s personalised bifold or trifold photo wallet for the next special occasion. Your original photos or unique designs are expertly printed on both sides to make a timeless classic leather gift. Need help with your design? Let one of our team of talented graphic designers help. Use our “Request a Proof” tab (above). Upload your photo and one our talented graphic designers will then take your image and professionally crop it to fit the dimensions of the case and email you a proof FREE of charge. The Christmas holiday season is just looming around the corner and people are already thinking about what they will get or give for Christmas. One of the most unique gifts that you can give your loved ones this holiday season is a personalised wallet. This is an appealing and very functional gift for that special occasion. Protect your iPhone with our Faux Leather Wallet Case – great as a credit card holder too….